Do you have a makeup station? We have a professional makeup station in our common area in Unit#300 that is available for rent for $20/hour and can be reserved in advance. You can also ask our receptionist for a folding table and chair(s) that you can take inside the studio room for your use. Our minimum booking time slot is 1 hour. Please note that the booking time includes your setup and clean up time. One of our staff members will be coming to your studio room 5-10 minutes prior to your end time to ensure that the room is left in its original state. Any additional time necessary for clean up is subject to extra fees. Is there a security deposit required to use the studio? When you arrive at the studio, you will be asked to provide your ID and credit card information. Our reception staff will visit the studio room 5-10 minutes prior to the end of your booking to ensure that the room is left in its original condition. If there are damages to floor / furniture / equipment you will be asked to reimburse the damage. Do you have steamer at the studio? We have steamers available for your use at no extra cost. Please ask our receptionist for a steamer and kindly return it once you are done. Do you have clothing racks? Each studio room includes a clothing rack for your use. Yes, our studio has free guest Wi-Fi. Visit the reception desk for the WiFi details when you arrive. Are there any types of equipment included in the studio rental? Does it cost extra to rent furniture? Each room comes with specific pieces of furniture and décor to correspond with the overall look and feel of the space. You can find a detailed list of items that are included in the rental price under each studio description. We are also working on putting together a catalogue with additional items that can be rented for an extra fee. Can we request or move furniture from another room? Furniture from another room outside your booking cannot be moved or requested. However, if you have multiple rooms booked with us at the same time, you are allowed to move the furniture from one room to another room. Please request assistance at the reception desk to ensure that the items are not damaged during the move. Can any merchandise, props or furniture be delivered to the studio before the shoot day? Please discuss your needs with us before booking to ensure we can accommodate the delivery. We might apply a holding fee for storage and we cannot assume any responsibility for loss or damage. I have never shot at the studio before, do I need any experience? With the abundance of natural light in our spaces, you don’t need any studio experience! If you are a natural light photographer, our space is a dream to shoot. Is there a freight elevator? There is a freight elevator (4 x 8 feet) that needs to be booked 48 hours in advance. Email us if you require an elevator for your photoshoot so we can book it for you. Please note that the freight elevator cannot carry passengers. Visitors need to use stairs to access the studio. There is free street parking along Campbell Ave, just south of our building. Please note that parking directly in front of the building has a one-hour limit. We have one reserved parking spot for anyone loading or unloading, please contact us for more information. Can I book the space for any events? 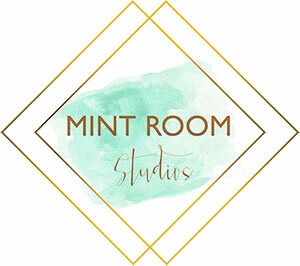 Mint Room is available for other events that would benefit the community and artists. If you are interested in holding a master class, seminar, training, meetup or any other event of this sort, please contact us directly, we would love to chat. Can you recommend a photographer/makeup artist, stylist, etc? We sure can! Check out our artists page or contact us directly if you are looking for a professional not listed on the page. Can I shoot video in your studio? You can shoot video at our studio but please note that none of the rooms are soundproof. Can I bring paint into the studio? Unfortunately, you cannot bring paint into our studio rooms. If paint was used during the photo session and has stained the walls or the furniture you will be asked to pay for the damages. Will you have the same furniture in 2019? We are always in the process of improving our rooms and our props, and there is a small chance that we may remove a beloved furniture item due to damage and replace it with another beautiful prop. Please refer to our website for the latest look of our rooms. If you are planning a photoshoot with a specific look or a prop in mind, please check with us before your booking.